Help the mischievous Pandas escape from the zoo and in return you could be on the receiving end of some lucrative free spin bonuses. Witness these bamboo loving bears perform circus tricks and keep an eye out for the insane Pandamania bonus icon and turn over the cards in this manic panda-themed online slot. With high quality artistry, technical expertise and personality built into all of their work, for nearly 20 years NextGen have been delivering online slot games that meet their ambition of Attract, Entertain, and Retain. Collectively sharing and growing a community of inspiration and innovation, they are always welcoming new members to their worldwide fanbase, and regularly rewarding them with new titles, and new ways to win big. If one Pandamania title wasn’t enough, NextGen have decided to deliver two! Along with the zoological fiesta that is the 5 reel, online slot version of the title, they have created a sister-scratchcard game for its fans to engage with. With a new way to play, of course, comes new ways to win, and there is a chance to actually get away with an incredible 50,000 times our stake, with just a few simple scratches. When we haven’t quite got the time to go gallivanting around the reels in search of rewards, a quick round of scratchcard fun could be our way to win. Featuring many of the lovable aesthetic touches that make the slot version of Pandamania so endearing, this scratchcard is loaded with charm, fun, and winning combinations. 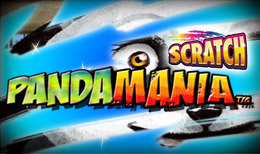 From a nice, easy £0.02, to a more challenging £0.50 (which, to be fair, is still much cheaper than a regular scratchcard), we can take a chance on Pandamania, and go for an unbelievable jackpot of 50,000x out stake! This is only available through a hidden bonus feature – an unusual twist on the usual online scratchcard games we encounter. The wins, of course, come from landing three of a kind symbols combinations, which start at a simple money-back win, with three balloons. Three bags of candy will double our stake, while ice creams offer a tasty five times stake bonus. Three trolleys means a 10x stake prize, three tickets a 50x win, and three Houdini symbols means a 100x stake victory! Three of the main stars of Pandamania – the Pandas – will result in an incredible 1000x stake reward. The only other symbol we will encounter is the Pandamania Bonus symbol, which puts us into the Ladder feature. This is where we can go for the big one, as we hope to land nine donuts on the screen, and take home up to £25,000! While this win awaits a lucky gamer somewhere – maybe turning them a little Panda-Manic in the process – the game packs enough charm and pays out enough wins to keep us entertained regardless. It’s a lovely little scratchcard game, and a worthy relation to the Pandamania slot. The bonus feature built into Pandamania is a great addition to the game, and not something you usually expect in a scratchcard title. The sound effects here are also of a high quality and, when combined with the vibrant visuals, make a simple game very effective. With regular wins aplenty, and the game bursting with character, Dream Jackpot give this scratchcard game a 9/10.